With recent advancements in technology and the move toward a digital grid, wireless connectivity is gaining more traction as an extension to wired connectivity for grid equipment such as circuit breakers, merging units, photovoltaic inverters, electric vehicle chargers and other asset monitoring systems. Wireless connectivity is a cost attractive solution for distributed energy resource management and grid asset health monitoring given its reduced deployment time for grid protection and control. Wireless technologies, such as Wi-Fi, Sub-1 GHz, Bluetooth® low energy and multiband standards, can stream large amounts of data at manageable power levels. Users can seamlessly monitor, protect and control grid equipment locally or remotely by accessing the system data through the asset or the cloud without compromising grid security. Wireless asset monitoring can be easily retrofitted onto existing equipment without adding the complexity that comes from underground cabling. Read our new white paper, "Enabling and integrating wired and wireless technologies for grid interoperability." Let’s discuss five key considerations when integrating Wi-Fi onto grid equipment. Connection to an external access point (AP) and/or the cloud. If you want to connect to an already established external AP and access the data from the cloud, the equipment with the Wi-Fi device, such as our CC3235S, CC3235SF or CC3220S, CC3220SF, is configured in station (STA) mode. The device connects to an already established external AP. Grid assets can send or receive messages to a remote handheld device that connects to the same AP or to the internet, as shown in Figure 1. Connection to a local network. For private networks, if you want to minimize the network range to prevent broader access or if an external AP is not available, TI devices can set up its own local network and communicate with other assets. One device is set up as the AP and other devices connect to it in STA mode, as shown in Figure 2. Access to both the asset and the data can be maintained locally within the zone of the established network. 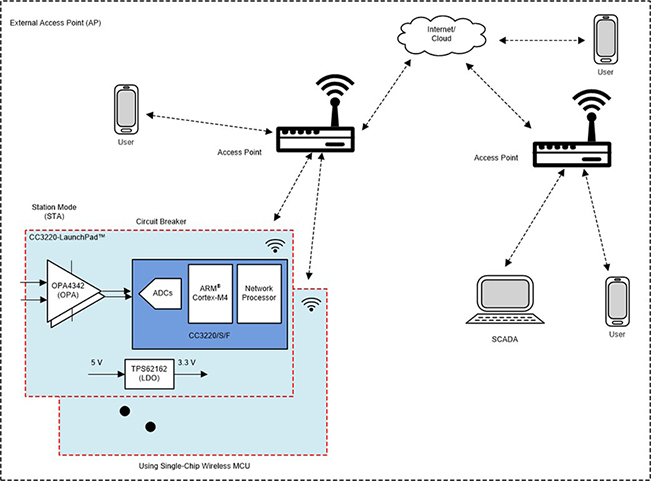 This architecture limits the number of stations that can connect to one SimpleLink™ AP to four. AP provisioning. In this mode, the unprovisioned Wi-Fi device wakes up initially as an AP. This enables the device to create its own wireless network with a predefined network name, letting users connect with an external device and add a profile to provision that device. By using this mode, users should know which device to connect to for provisioning using secured authentication. SmartConfig™ provisioning. This is TI’s proprietary provisioning method. It uses a smartphone or tablet to broadcast network credentials to an unprovisioned TI Wi-Fi device. The device scans for SmartConfig broadcasts while operating in STA or AP mode. One of the key benefits of Wi-Fi connectivity is on-demand access to large streams of grid data. The data could include parameters such as phase voltage, current, power, etc., and factors such as operating temperature, vibration and insulation breakdown, which indicate the health of the asset. The data could also be used to monitor system/equipment status. For other applications, wireless access enables the control of equipment settings by sending commands through the cloud to remote grid assets. It is also possible to update equipment firmware through the cloud using over-the-air updates. The device is in “always connected” mode for applications with minimal latency. It receives beacons from the AP at specified time intervals. Low-power deep sleep (LPDS) mode is enabled between beacons as a setup in long sleep interval (LSI) policy. The AP can request data during beacons, since the STA is in always-listening mode. In addition, the STA can transmit data between beacons if necessary. The characteristics of the current consumption during this mode are given below. The average current consumed by the CC3220 Wi-Fi MCU solution is ~700 µA (0.1-s beacon) and 2 mA with data transfer. The power supply should be designed to account for peak loads, as shown in Table 1. The device can be in “intermittent connected” mode for applications where data is transmitted at longer intervals (≥10 s) in order to minimize power further. However, in this mode the AP cannot request data and data request is initiated by the STA. It takes the STA ~250 ms to wake up and establish a connection. Figure 3 shows the switchable power profiles. Security is primary importance in grid to help mitigate the threat from unauthorized users getting access to sensitive data and control of the grid equipment. One of the exposure points for the threat is in the network layer where the grid assets connect to the cloud. Our SimpleLink Wi-Fi device enables networking security, local area network (LAN) security and physical device-level security at different levels of connectivity. More details on the security features of the device can be found in this application report. The CC3235S, CC3235SF SimpleLink Wi-Fi device supports 5 GHz in addition to 2.4 GHz and has Bluetooth® Low Energy/2.4-GHz coexistence. And while security is one of the biggest challenges of wireless communication, advancements such as hardware crypto accelerators, file encryption, file authentication, clone protection and secured boot have been incorporated into the CC3235S, CC3235SF to help prevent unauthorized users from gaining access and control. These devices provide enhanced security with Federal Information Processing Standard (FIPS) 140-2 Level 1 certification, with up to 16 concurrent secure sockets. Figure 4 shows the functional block diagram for the CC3235S, CC3235SF. Grid engineers can use Wi-Fi connectivity as an extension or as a redundant communication path in addition to wired communication. Wi-Fi can be used to enhance connectivity in order to monitor and control any asset from a remote location through the cloud. Our CC3220S, CC3220SF and CC3235S, CC3235SF Wi-Fi radios with an integrated network processor and applications processor (ARM® Cortex®-M4), extensive security features and our reference designs, provide an easy, quick and secure way to add Wi-Fi connectivity to residential or substation grid equipment. 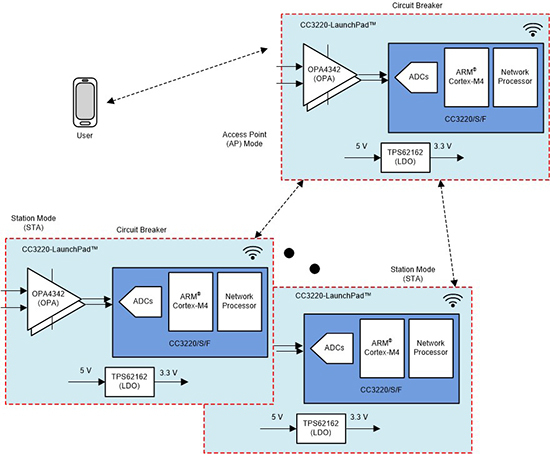 Check out our reference design, "Grid IoT Reference Design: Connecting Circuit Breakers and Sensors to Other Equipment using Wi-Fi®."